The London West End is known as Theatre land due to the high number of world class theatres in the area. 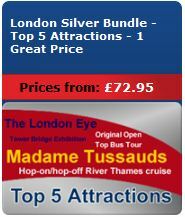 It is also packed full of things to do and see and has plenty of places to eat and relax in too. In fact there are so many that this page will only be able to scratch the surface, more will be added to our forth coming guide. You will need more than one day to explore this central London location and I recommend that you plan your day well in advance to avoid exhaustion and possible disappointment if venues are fully booked. Leicester Square (near Charing Cross Rd) - This is a hub of entertainment, lots of places to eat, a cinema, a small park, theatres and nightclubs. Soho - This is a London west End area between Oxford Street and Shaftesbury Avenue. The area was originally known for its adult shops but has since been cleaned up and is now a fashionable district of quality restaurants and media offices, although there is still a small selection of adult venues. Piccadilly Circus - This is a junction which links directly to Shaftesbury Avenue, the Haymarket, Coventry Street and Glasshouse Street. The area is a tourist attraction known for its large video displays and neon signs mounted on a corner building. There is also a famous memorial fountain and statue known as Eros but which is actually Anteros. 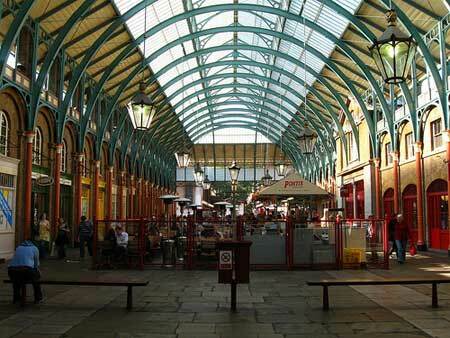 Covent Garden - This is one of London's biggest tourist areas. The area was originally known for it's fruit and veg market but which has now been transformed into a fantastic area of quality gift shops and outside cafe areas. The area is also known for its premier entertainment venues such the Royal Opera House, Theatre Royal, Drury Lane and the London Transport Museum. Covent Garden is also known for its street performers, which can be seen most days performing all sorts of strange and amazing acts from magic tricks and juggling to classical music and comedy shows. The London west End is the entertainment center of the city. You can't turn a corner without coming across a world class theatre, cinema or music venue. Royal Opera House - (Covent Garden) - The home of The Royal Opera and The Royal Ballet. Theatre Royal - (Drury Lane) - The building today is the forth theatre at this location since 1663 which makes it the oldest theatre in London. National Portrait Gallery - (St Martin's Place) - The collection consists of portraits of historically important and famous British people. This was the first portrait gallery to open in the world in 1856 and has been at its current location since 1896. London Coliseum (St Martins Lane) - This is a opera house and theatre and is one of the largest and best-equipped theatres in London. It opened in 1904 and has been providing top quality entertainment ever since. Stringfellows Nightclub - (16 - 19 St Martin's Lane) - This famous nightclub is for those who like the more extravagant and energetic side of life. Not cheap but if you love to dance the night a way, then this could be the club for you. The area is packed with places to eat. From simple cafes where you can buy a sandwich or a light meal to top class restaurants. 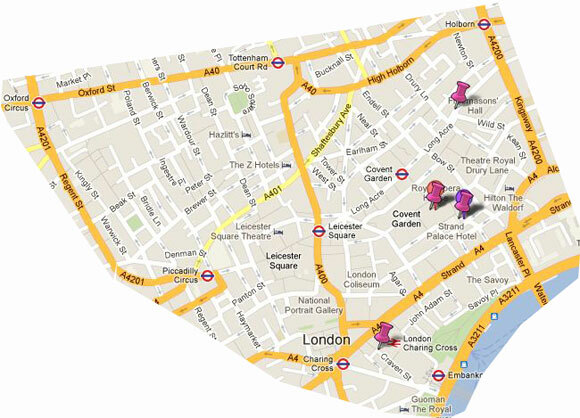 Here is a small selection of restaurants in the London West End area. The whole of the West End of London is a shopping zone. 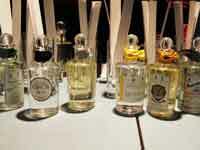 Shops range from small souvenir shops to high end fashion stores and luxury goods. Oxford Street - a mix of high street stores and Tourist shops. A main shopping area. Regent Street - Better quality stores can be found here including Hamleys Toys shop. The Strand - A Mix of shops, Theatres and historic buildings. Covent Garden - Quality gift stores and hand made goods sold in the market area.